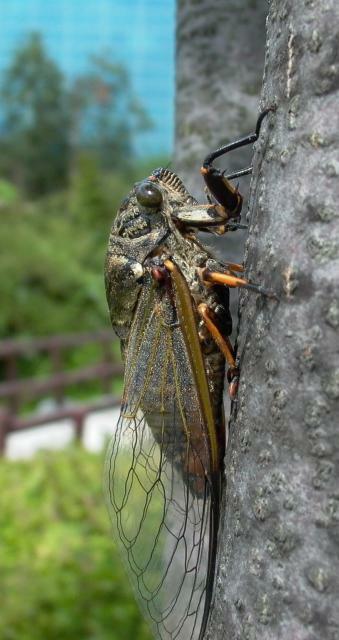 Cryptotympana atrata (Fabricius, 1775) is a cicada found in China and Korea. Cryptotympana atrata was formerly named Cryptotympana sinensis. Photo by Jon Allen in Yeouido park in Seoul in South Korea. [Male] Head ochraceous; front with the margins (but not meeting at apex) broadly castaneous; eyes olivaceous; ocelli reddish-ochraceous, with their surrounding area castaneous. Pronotum castaneous, the margins and a central fascia, which is much widened and ampliated at base, ochraceous. Mesonotum ochraceous, with two large obconical castaneous spots near each lateral margin and two large, central, very obscure obconical spots, which are only visible by their slightly darker margins; basal cruciform elevation pale olivaceous. Abdomen above ochraceous, the posterior segmental margins castaneous. Body beneath and legs ochraceous; face with the lateral carinae castaneous; apices of the tibiae and tarsi castaneous. Tegmina pale hyaline, the venation ochraceous, the costal membrane pale greenish, and the basal third of the tegminal area tinged with pale ochraceous. Wings pale hyaline, the venation ochraceous, and the base narrowly tinged with pale ochraceous. 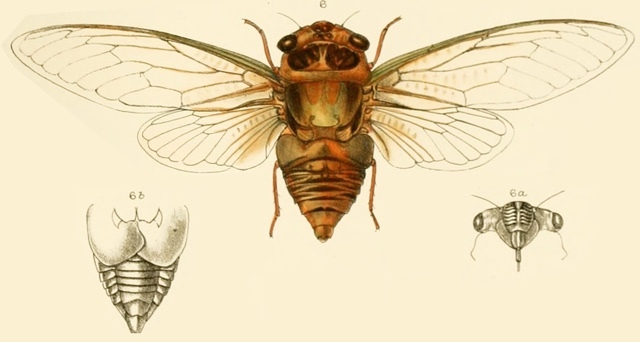 The face is tumid, the lateral carina robust and slightly waved; the rostrum extends to the intermediate coxae; the opercula are somewhat short, with their lateral margins slightly concave and their posterior margins oblique, they overlap at the center, and their apices extend to about the second abdominal segment. Long. excl. tegm. [male] 40 millim. Exp. tegm. 118 millim.